Students will utilize the elements of design by drawing a fish based on the story. The elements of design are in almost everything students come into contact with and exist in all forms of art. This book has English Language Arts ties in that students must listen, respond and use information gained from a story to create their artwork. The lesson can also be tied to science depending on the intensity of discussion about fish. Line: a continuous mark, made by a tool. Can be horizontal, vertical or diagonal, straight or curved, thick or thin. Shape: a closed line. Shapes can be geometric like squares & circles; or organic, like free form shapes. Shapes are flat & express lengths and widths. Forms: 3-d shapes, express length, width, and depth. Boxes are forms. Space: area around and between objects. Can be used to create a feeling or illusion of depth. Color: light reflected off objects. 3 characteristics: hue (name), value (light or dark) and intensity (how bright or dull). Texture: Surface quality which can be seen or felt. (rough, smooth, shiny, hard) Textures don’t always feel the way they look. A picture of a porcupine may look prickly, but isn’t. Author: person that is responsible for writing a story or book. Illustrator: person that is responsible for the visual representation of a book. Share: to allow others to use or participate in something that belongs to you. 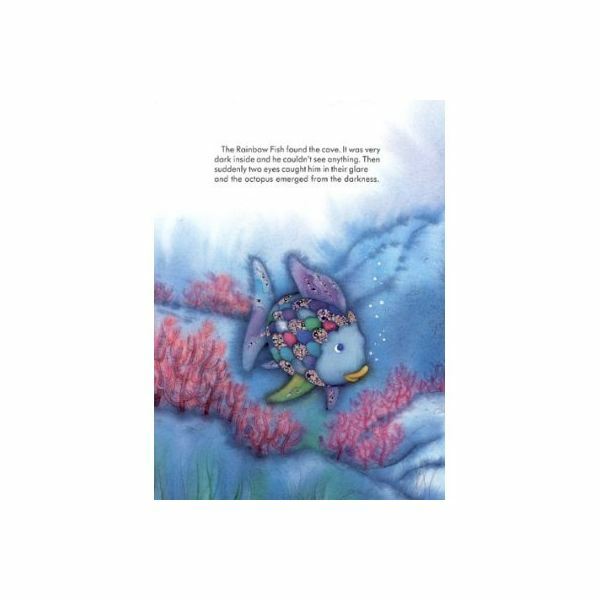 The students will listen to and discuss the story The Rainbow Fish by Marcus Pfister. Questions/Points to cover: author/illustrator, the illustrations, what students learned from the book, what specifically they liked from the book. “Do book illustrations always have to be drawings or paintings?" (photography/computer designs) The teacher points out various elements of design within the illustrations. The teacher asks students about the different parts to a fish. (Body, gills, scales, eyes, fins, tails, mouths) The teacher will call on several students to answer question as well as giving positive feedback and help/prompting if students are unsure. After all basic parts of a fish are named, the teacher asks, “if all fish have a body, gills, scales, eyes, tails, fins and mouths, do they all look the same?" The teacher shows students several pictures of fish and asks what makes them different. The teacher puts these things on the board. Color, lines, textures (elements of design), size. The teacher can elaborate as needed. 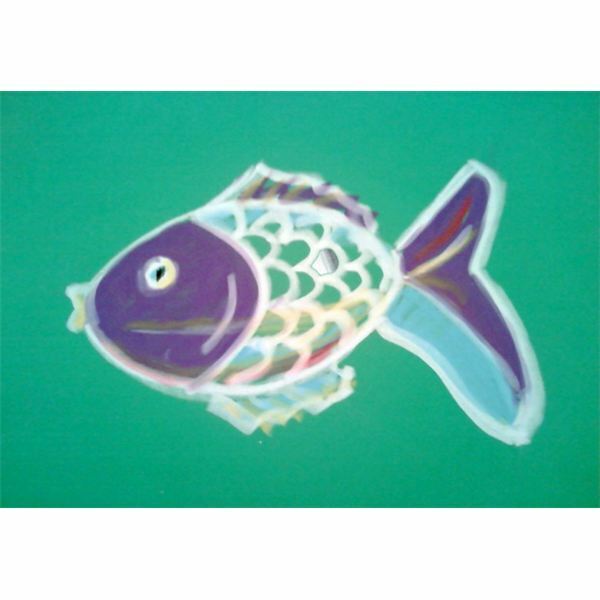 Students are also shown Matisse’s Goldfish paintings as an inspiration and to see how these fish are different from the fish they read in the story. Students are going to create their own rainbow fish using chalk. They have to try to include all the body parts listed on the board. (Body, gills, scales, eyes, fins, tails, mouths) They will glue on one silver scale when their drawing is complete. Students receive their materials (a sheet of blue, purple, or green construction paper & a piece of white chalk) and the teacher demonstrates at the board how to draw a fish body (with variations on how to draw different size/shaped bodies, tails and fins by breaking a fish into basic shapes). The teacher also shows students how easy it is to “erase" if they make a mistake, by gently rubbing chalk. Optional: Students may decorate the area around their fish with plants, bubbles, or other sea life. The teacher may also use google eyes on the fish. What does an illustrator do? Are all illustrations drawings? What is something new you learned? Tell me something about the book that you liked…. What are some parts of a fish? Do all our drawings of fish look the same? Why not? Are all lines straight? What are some other lines? What happens when we put lines together? What kinds of shapes do we see in fish? Do fish have texture? What else has texture? Teaching experience; author’s own photograph.